A generational work that, using television, reframes America’s identity through the rattled mind of a septuagenarian, insomniac, cable-news-junkie president. In the tradition of great cultural figures like Marshall McLuhan and Neil Postman, New York Times chief television critic James Poniewozik traces the history of television and mass media from the early 1980s to today, and demonstrates how a “volcanic, camera- hogging antihero” merged with America’s most powerful medium to become our forty-fifth president. Beginning where Postman left off, Audience of One weaves together two compelling stories. The first charts the seismic evolution of television from a monolithic mass medium, with three mainstream networks, into today’s fractious confederation of “spite-and-insult” media subcultures. The second examines Donald Trump himself, who took advantage of these historic changes to constantly reinvent himself: from boastful cartoon zillionaire; to 1990s self-parodic sitcom fixture; to The Apprentice-reality-TV star; and, finally, to Twitter-mad, culture-warring demagogue. A trenchant, often slyly hilarious, work, Audience of One provides an eye- opening history of American media and a sobering reflection of the raucous, “gorillas-are always-fighting” culture we’ve now become. 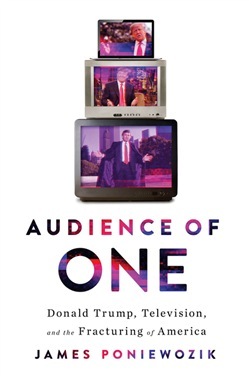 Acquista Audience of One: Donald Trump, Television, and the Fracturing of America in Epub: dopo aver letto l’ebook Audience of One: Donald Trump, Television, and the Fracturing of America di James Poniewozik ti invitiamo a lasciarci una Recensione qui sotto: sarà utile agli utenti che non abbiano ancora letto questo libro e che vogliano avere delle opinioni altrui. L’opinione su di un libro è molto soggettiva e per questo leggere eventuali recensioni negative non ci dovrà frenare dall’acquisto, anzi dovrà spingerci ad acquistare il libro in fretta per poter dire la nostra ed eventualmente smentire quanto commentato da altri, contribuendo ad arricchire più possibile i commenti e dare sempre più spunti di confronto al pubblico online.